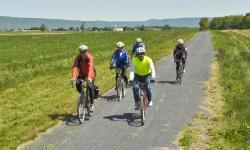 A distinctive assortment of biking trails can be found in Pennsylvania’s Cumberland Valley, just a quick drive from Philadelphia and Washington, D.C. The bike routes of Cumberland Valley offer the perfect combination of scenic downtowns, pristine natural habitats and landmarks rich in history. 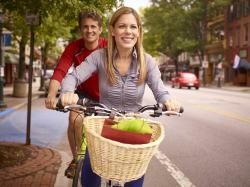 The bike-friendly borough of Carlisle was even ranked the fifth-best place for walking and biking by Money magazine, and the Cumberland Valley has a range of great places to stay along the ride. We’ve picked out a few of the best biking routes that make for Cumberland Valley’s most scenic overnight visits and weekend trips. A former railway that’s been converted into an 11-mile trail for bikers, hikers and horseback riders, the Cumberland Valley Rail Trail is packed with wildlife-watching stops, waypoint signs and historical items of interest. The majority of the path consists of packed, crushed limestone for a smooth ride from ample parking at either end of the trail. Home of the two-mile Cumberland County Biker/Hiker Trail, Pine Grove Furnace State Park offers a short, pretty ride that’s great for groups or beginners and has a dedicated parking lot. The site of the historic Pine Grove Iron Furnace, the now-picturesque park’s mountain biking trails feature the woodland paths of Michaux State Forest. Mountain bikers will find their bliss on the four-mile hiking and biking trail that offers lakeside access to the 59-acre Opossum Lake. The sprawling 274 acres of this rich forest recreation area is also a favorite for birdwatchers and picnickers, and the trail features signs that identify points of interest including beaver habitats, wetlands and unique plants and wildlife along the path. For history buffs, Army Heritage Trail is an interactive trail loop that features a Huey helicopter, an M-46 Patton tank, artifacts from the French-Indian War and a memorial garden to all of the American lives lost in those conflicts. For bicyclists on a training regimen, it’s a nearly perfect one-mile trail that lets you easily count how many miles you’ve ridden. The historic town of Carlisle features a scenic, urban 14-mile ride that connects the eight different parks downtown. Check out the Carlisle Borough Bicycle and Pedestrian Trail Map, which details the routes between each park. This 40-mile ride for serious bikers presents an authentic backroads trip coasting through picturesque Boiling Springs, the award-winning biking hub of Carlisle and mountainous Mt. Holly Springs. Take the loop whichever direction you prefer for a weekend trip, with dozens of restaurants and outdoor attractions along the way. Long rides pay off with scenic views at the peaks and canyons of the Cumberland Valley in this expansive 50-miler that pedals between Carlisle and the historic district of Newville, visiting higher elevations than any bike path in the region. There are two versions of this distinctive, low-traffic rural crossroad loop―a 24.2-mile and a 32-mile trail―both between the history-lover’s dream Mechanicsburg and Boiling Springs, with some great restaurants and things to do along the way. Need a bike rental? No problem. You can rent bikes and other gear from Holmes Cycling & Fitness in Camp Hill or Merv&apos;s Bike Shop in Shippensburg. Cumberland Valley is an inspiring hiking and biking paradise, with an unbelievable assortment of trips winding around the famed Appalachian Mountains. Plan your Cumberland Valley biking weekend with these bike routes, and then browse lodging options to plan your overnight or weekend biking trip.